George, Cammie, Lawrie, Jim and Gordon Spence. No account of the importance of families in Scottish athletics could be done without covering the five Spence brothers from Greenock. As you see from the picture above, three of them ran for Greenock Glenpark Harriers and two of then wore the colours of Greenock Wellpark Harriers. Jim was the first to appear in the national rankings in 1964 and Cameron was the last in 1988. They covered distances from 800m through to marathon, they ran track, road, cross-country and hill races. The five between them produced excellent runners, good coaches, quality officials and top grade administrators. They had been brought up in a sporting family – father was a very good football player who turned down the offer to play as a professional – but oldest brother Jim was the one who started running first and, although Cammie did play football for a while, the five were all involved in running. Jim is the oldest with George just two years younger. Then comes Gordon with Cammie almost five years later and finally there is Lawrie. We can look at them individually in order to start with. 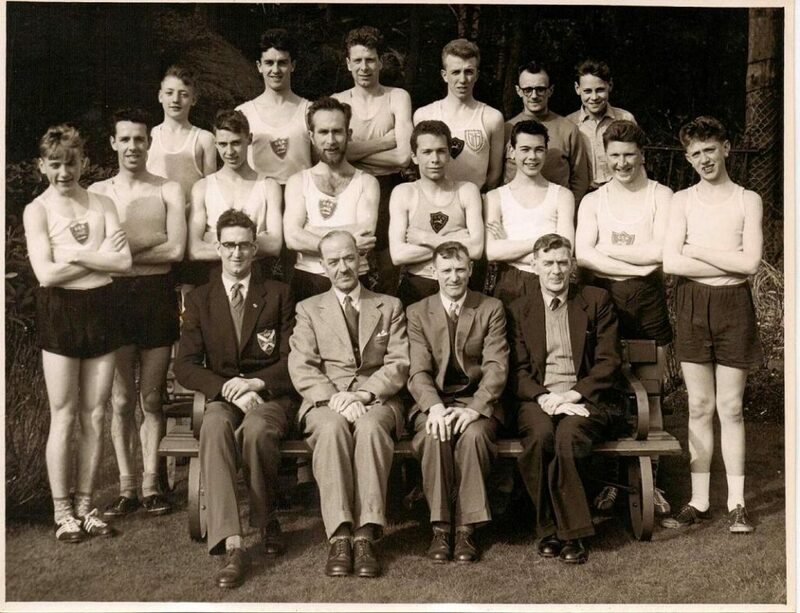 Jim ran in all the events and all surfaces in the country in the 1950’s and 1960’s He ran in at least 15 District championships, his first run in the national cross-country was in 1957/58 as a Junior Man and his last run out in the event was in 1969/70; he ran in 14 Edinburgh to Glasgow relays on 6 different stages. His main successes however came in the longer road races and he was a member of the Scottish Marathon Club and the following information has been gleaned from the club’s Minute Book. 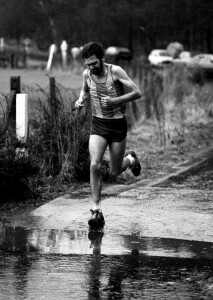 JA Spence of Glenpark Harriers joined the Scottish Marathon Club in early Spring 1968. By 19th August, Committee Meeting minutes confirmed that, in his first season, Jim Spence had become Club Champion! The Championship consisted of a member’s best three runs from four races which had to include the SAAA Marathon Championship, The others were the Cambuslang 12, the Clydebank to Helensburgh 16, the Strathallan 20 . Jim did not compete in the 12 mile event at Cambuslang on 20th April, and Andy Brown (Law and District) was first SMC man home, gaining six points. On 27th April, Jim Spence finished fourth, and second SMC, in the 16 mile Clydebank to Helensburgh race, which gave him four points. His time was well inside SMC First Class Standard. However Andy Brown was second and first SMC – so far his total was 12 points for the season. 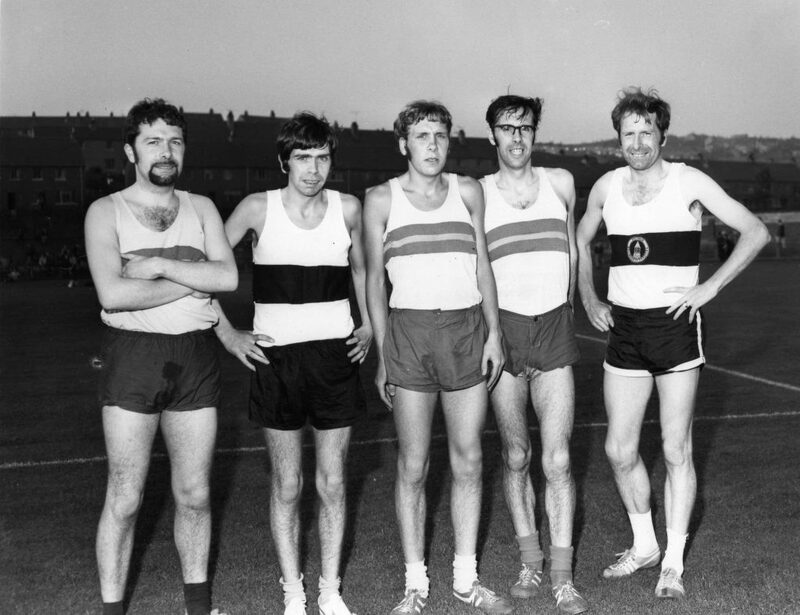 The 1968 SAAA Marathon took place at Grangemouth on 22nd June. Jim ran well to finish fourth in 2.39.42, which was inside the SAAA National Standard and SMC First Class target. He was second SMC man home and gained another five points, which gave him nine points so far. On 3rd April the final counting race took place: the 21 mile Strathallan Highland Games road race. After a very close battle with his SMC club rival Don Turner (Pitreavie AC), Jim finished fourth, just eleven seconds in front of Don, which gave him another five points as first SMC. He remained a member of the SMC and continued to run well in its fixtures but this was his only club championship. When he stopped enjoying his running, Jim retired but he was also a coach. I remember going to the West District Track Championships at Westerlands in Glasgow and meeting up with him again after many years. He was, he said, coaching his young brother Lawrie. He had however worked in that capacity with all his brothers at one time or another. Cameron was the only one who followed his father’s football example and left the sport to play football for four years. He came back in 1970 and trained with Jim to start with before deciding to train according to his own methods. A group photograph with George Spence third from left in the back row, Jim Spence second from left in front row and Gordon Spence fifth from left in front row. George was a cross-country runner for the club, and first ran in the national cross-country championship as a Youth in 1958/59 when he was sixty sixth, as a Junior in 1958/59 and 1960/61 when he finished down the field. George is better known as an official by the present generation. He was an administrator with the SAAA and the Cross-Country Union. 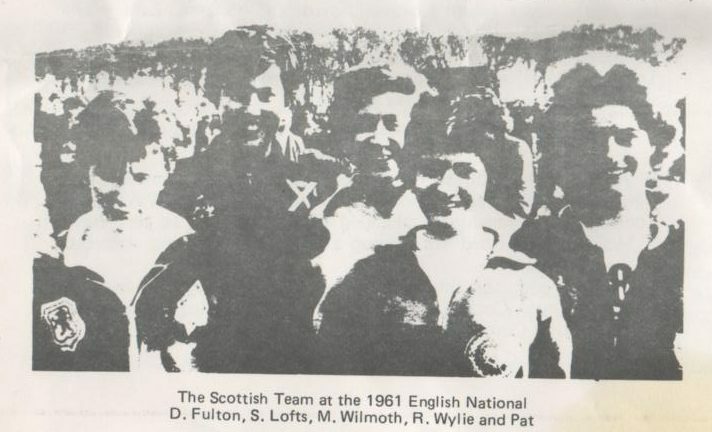 As a competitor he had done some long jumping on the Games scene so it was no surprise to see him involved with the “Heavies” at many Highland Games both as an official and as convenor. A Greenock man, he specially enjoyed Bute and Cowal as well as the local one at Gourock. He had had to stop running because of his knees. He was very active in the district events. He had a particular involvement in the anti-doping and drugs control issues. Latterly he gradually stepped down from his various posts. The last of these were Bute and Cowal. Gordon, born in 1945, showed talent as a school boy when he was runner-up in the school championship in second year then, a year later, was third year champion winning all the running events including the hurdles! He followed this with the Renfrewshire schools Under 15 half-mile title. 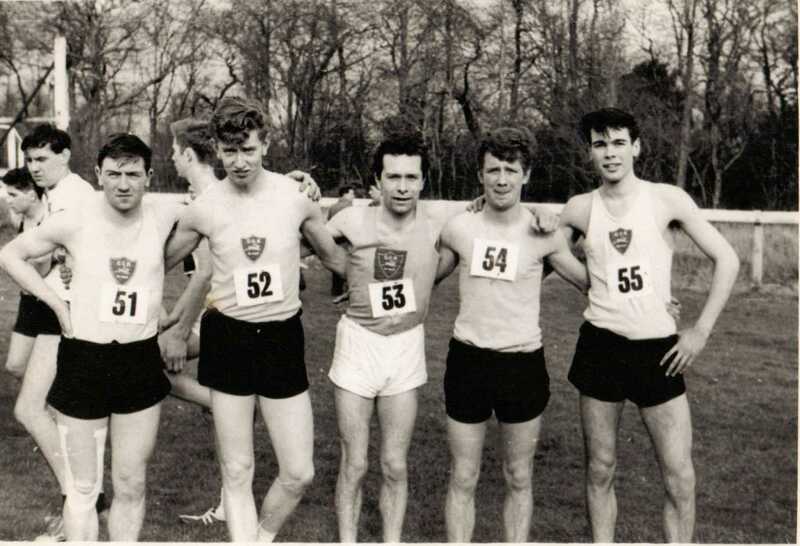 With Glenpark Harriers, Gordon first appeared as a Boy in the District Championships in 1960/61 when he was third, leading the team to second place. Two years later as a Youth (U17) in 1963/64 he was third behind team mates Tom Dobbin and Ronnie Arthur to provide the winning team for Glenpark on a day when Jim was a member of the winning Senior team. Later that season in the National Championship, Tom was seventh, Teddy Walker 39th, Gordon 42nd and Ronnie 45th to be fifth team. It was a really good team – Tom was one of the best half-milers in Britain in his age group, Ronnie was another half miler and a solid club runner and Gordon had a great deal of potential as these results showed. After winning the Greenock District Junior Cross-Country Championship but after that problems with knee and leg injuries he dropped out of the sport. All the brothers, except Lawrie at that time, joined IBM(as it was known at the start – it later became IBM Spango Valley) athletic club in 1973. Started as a result of local athletic politics, it attracted a lot of interest locally. Gordon raced occasionally for IBM. WHe was a good club runner but kept getting injured. Knees were the problem, as Cammie says, it was a bit of a family trait. Gordon stopped altogether in the ’80’s. but bas been cycling to keep fit and has been averaging about 5000 miles per year. In 1961 Cameron appeared in the District results for the first time, being ninth in the Boys one and a half miles and part of the second placed Glenpark team, launching a great career in the sport as runner, organiser, administrator and coach. Cameron, known to everybody as Cammie, was born on 19th July in 1950 and ran for five Scottish clubs (with an affiliation to one Irish outfit). The Scottish clubs were Greenock Glenpark Harriers, Greenock Wellpark, Spango Valley, Inverclyde and in the summer of 1973, Shettleston Harriers. On the track he was ranked nationally from 1972 to 1988 in 3000 m, 5000m and 10000m with personal best times of 8:22, 14:10 (at the RAAA Championships) and 30:00.84. On the road there are times of 64:18 for the half-marathon and 2:28 for the marathon. All good times and he was really competitive whatever the surface. He hated the track because “it was so bloody hard” but he did run it in championships and in Highland Games. Nevertheless, he is better known as an international cross-country and road runner. He started as a boy with Glenpark between eleven and fifteen years of age, then departed to play football. It was not really surprising given that he was living in the West of Scotland where football is almost a religion, and that, probably more important, his father was player. He played at the top level as an amateur before coming back into athletics in 1970. His first national was in 1960/61 when as a Junior Boy he was fifth in the District championships and 63rd in the national. 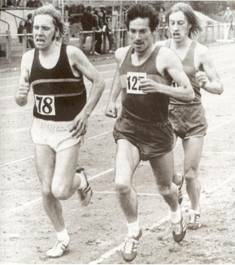 After the football period, he came back to athletics in 1970 and trained for a while with younger brother Lawrie, coached by big brother Jim. With encouragement from brother George and his wife Pat he joined Greenock Wellpark Harriers. His first run in Wellpark coours was in 1970 at Bute Highland Games. It was in the Mile Handicap, he was the back marker. Jim and George complained to the handicapper because Cammie was a novice. It was his first race in 5 years and he shouldn’t be the back marker. The handicapper would not change his mind. Cammie, however, finished 4th. At the following weeks Cowal Games he finished third on the Friday and, it being the age of the amateur, won a plaque. He still has it. “It started in 1979 when I fell out with the Scottish selectors. 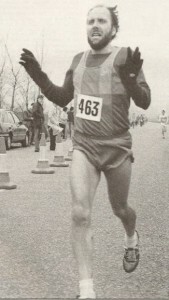 I won the International race at Stirling University grounds running for Scotland in 1978. Won it quite easily and was picked to run in Belfast (which was cancelled due to the Troubles), and San Sebastian on the back of that win. Then went to Spain and picked a bug up (likely on the plane) and ran poorly. When I got home I had a chest infection. Missed training for a number of weeks and as a result missed the National but asked the selectors to consider me for the Worlds. They didn’t. “I hated marathons. 20 miles and body switched off. Every time except…………………in 1984. Ran at the Cowal Games on the Saturday in the 5K. 2nd to Lawrie in 14.53. Then it was 8 pints of lager and Chinese meal after. The wife got me up at 9.30am on Sunday morning saying you had promised to run the Inverclyde Marathon with Terry Wilkie. I just remembered after the 5K he asked me. So I had a cold shower to wake and sober up and get a entry on the day(morning)and got to the start line just in time. Off we went. Time passed by in a sort of blur. We stopped for water, we stopped for sponge fights, we stopped to get our picture taken. Our last stop was just before the mile to go mark. Clearly a quality athlete with that wonderful story about captaining Ireland in the World Championships with his brother captaining Scotland. What about Lawrie? Lawrie Spence is by the best of the brothers competitively and many consider hiim the most complete Scottish distance runner ever with best times ranging from under 4 minutes for the mile to 2:16 for the marathon. He has also captained the Scottish team in the world cross-country championships succeeding the great Jim Alder. He won his first cross-country championship as a Senior Boy in 1967/68 when he won the South West District championship and he finished sixth in the National championships at Hamilton that year too. The cross-country career was quite outstanding and led to Lawrie having no fewer than eight appearances in the world championships, as well as many really excellent domestic races – eg in the national, although he never won it, he had several races where he was second, third and fourth. On the track Lawrie had many successes and his list of personal bests is impressive. Lawrie has won medals at the AAA’s championships, has 7 gold and 2 silver medals from the SAAA championships, run in the Commonwealth Games and was ranked almost every year from 1970 to 1986 inclusive. Over the country he has run 8 times for Scotland in the world championships as well as in many smaller representative teams. For the complete story of his fine career in the sport, follow the link at the top of this section, just below his photograph. There is one more Spence to be mentioned: not a boy and not a Spence by birth but Pat Spence was very much a member of the family. As Pat McCluskey she was second to Dale Greig in the SWCCU Championships in season 1959/60, and won it from Dale in 1960/61. In ’61 she followed the Scottish run with 9th of over 200 runners in the English national. 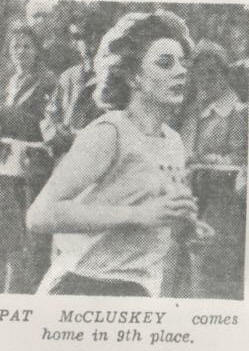 In each year she was in the winning team – Tannahill Harriers in ’60 and Greenock Rankin Park in ’61. Pat married George Spence and they have two daughters, Gwen and Lorna. She was the life and soul of Greenock Rankin Park Harriers and helped develop them into one of the top cross-country clubs in the country. Rankin Park came from nowhere to being one of the top cross-country clubs in the country during the 1960’s – eg. first in the National in 1961, second in the National in ’64, and in ’65, third in ’66. Pat herself was a talented athlete winning District as well as National cross-country titles. She was just as much at home on the track: in 1959, aged 19, she was ranked seventh in Scotland in the half-mile with a time of 2:30, in ’61 she was fourth in the Mile with 5:31.1. She retired from competition after marrying George Spence but kept the club running and performing at a high level. But when she came back in 1970/71 she was maybe even better – certainly she won several SWAAA championship medals – second in the 3000m and third in the 1500m in 1971 and third in the 1500m in 1972. In ’71 she also won the West v East 1500m, and was second in the East v West 3000m and in the West 3000m. ie in 1971 she won the West 1500m, and was third in the national 1500m, was second in the West 3000m, the E v W and the National 3000m. In that year she was ranked 7th in the shorter distance and fifth in the longer 3000m event. On the country she was seventh in ’71/72 and 16th in ’73/’74 but the real achievements in the early 70’s was the development of the club team: 5th, 3rd, 3rd, 2nd with runners in every age group. eg in 1971/’7 the Seniors were third, , the Inters ninth, the Juniors twelfth and the Minors ninth. Names like Duncan, Langan, Brown, Lafferty were becoming known as the started to move through the ranks. In the national rankings for 1974 Alison Brown was ranked 14th in the 800m and 9th in the 1500m, Lesley Langan was 26th in the half mile and Pat herself was 16th in the 3000m. Note: that was the Senior rankings and the younger women had come up through the age groups. With things going so well, it was tragedy in every sense of the word when she died in hospital in September 1976. Most of all for George and the entire family but also for Scottish athletics. A very popular, talented athlete with a great future in the sport taken from us.